If the version number is 011 or higher, it is not necessary to install this firmware upgrade. Download the UPDATA_11x011M.ZIP file to a temporary or download directory (please note this directory for reference), and extract the Zip file. Go to the directory where the file was downloaded and verify that the size of the UPDATA_11x011M.ZIP is 48.0 MB (50,435,241 bytes). In the UPDATA_11x011.ISO information screen verify that the size listed is "48.1 MB (50,475,008 bytes)". 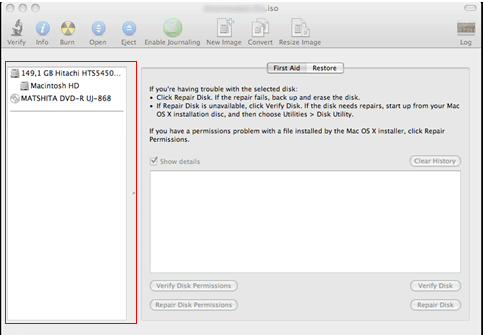 Drag and drop UPDATA_11x011.ISO file from the location where the file was downloaded (temporary or download directory) to the left pane of the Disk Utility window. Select UPDATA_11x011M.ISO Click the [BURN] icon. In the appearing window click the option [BURN]. The UPDATA_11x011M.ZIP upgrade file I downloaded from the upgrade web site cannot be extracted.